This is the replacement of an earlier article, lost in the hosting upheaval in April 2108. The extraordinary frame which is the focus of this piece reflects the emotions raised when the security of The Frame Blog seemed to be founded on very sandy ground. 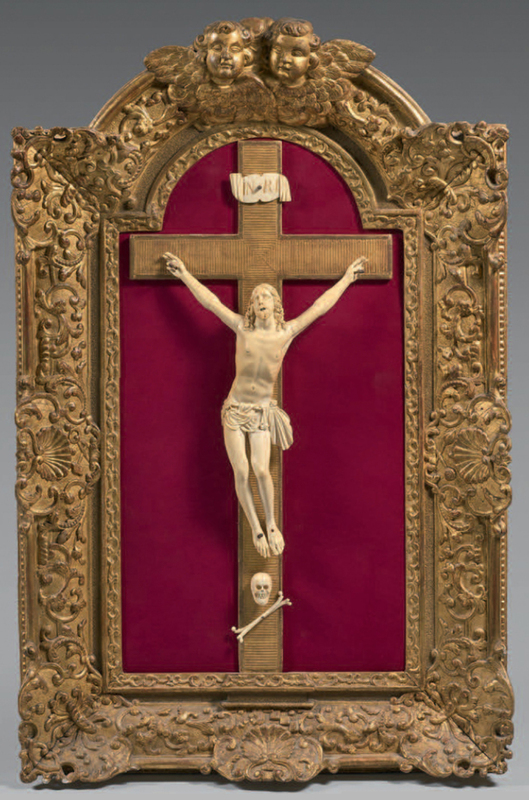 This maddening and unfortunate interruption in the output of frame articles also disrupted a post on the latest Drouot auction, which included a group of antique frames, including this arched Louis XIV example, made after a characteristic pattern for the carved ivory figure of the crucified Christ which it contains. It is topped by two delightfully befeathered cherubs’ heads, one looking beatific in its ruff of little stubby wings, the other unaccountably dyspeptic. There is a very slight fortuitous link between this work and the image at the head of this piece; see below. The latter is made up partly of a painting by the Croatian artist Paško Vučetić (1871-1925), and partly by a frame, added slightly later, by the architect Viktor Kovačić (1874-1924). 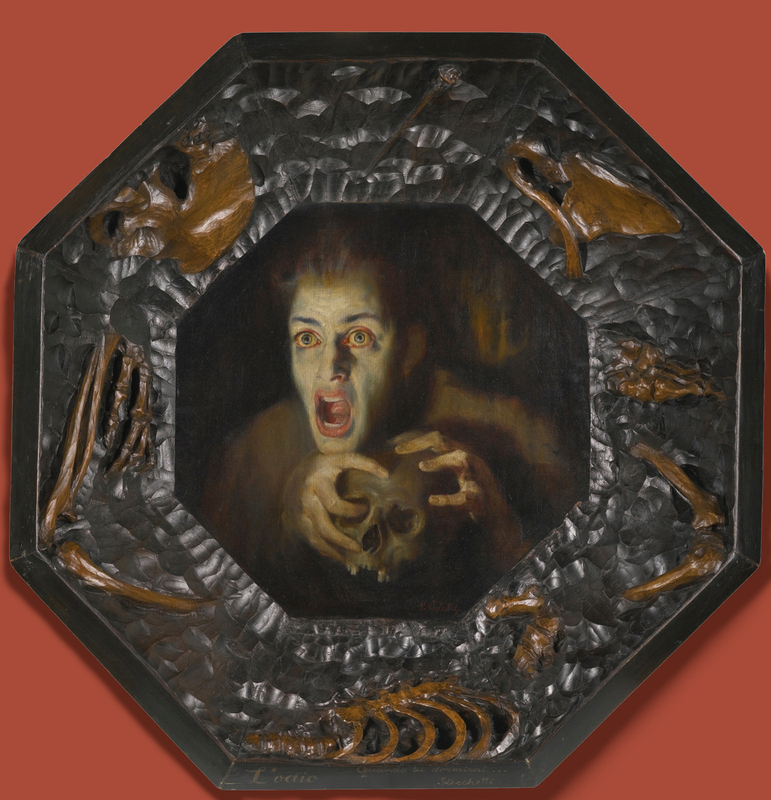 Its title is Hate and madness, or Mržnja i ludilo in Croatian, and it is one of those integral works of art where – in spite of the disparity of dates – it is even more evident than in general that the painting would be incomplete without the frame, just as the frame would have little function without the painting. Vučetić was born in Split, in what was at one time known as Yugoslavia, and was trained in Trieste and Venice (in the Accademia di Belle Arti di Venezia); he also lived in Munich. When this painting was executed he was working in Rome, but he returned to Belgrade in 1903, which is probably when the frame was made. 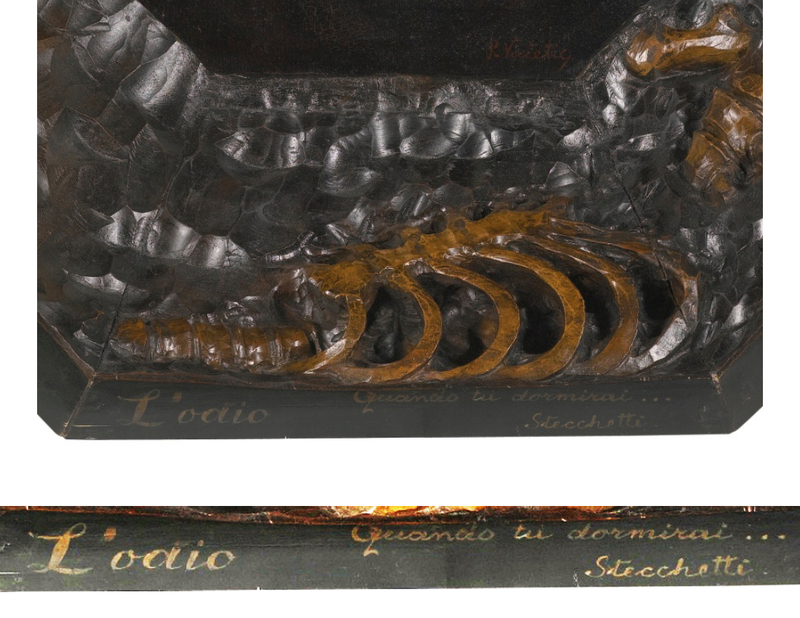 He was also a sculptor, and it is highly likely that he provided a clay modello for Kovačić, on which the carved frame was based. 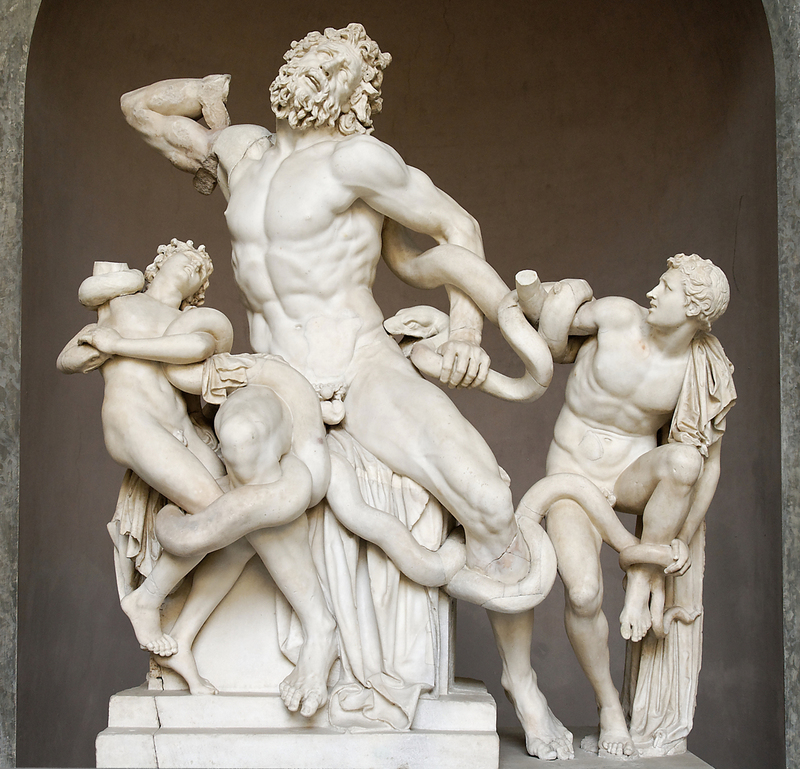 The painting is an offshoot of the ancient fascination of artists and sculptors with the depiction of intense human emotion through facial expression and gesture, seen as early as the Hellenistic period in sculptures such as the Laocöon, and continuing into the modern era, with particular interest, perhaps, from artists during the Baroque period. 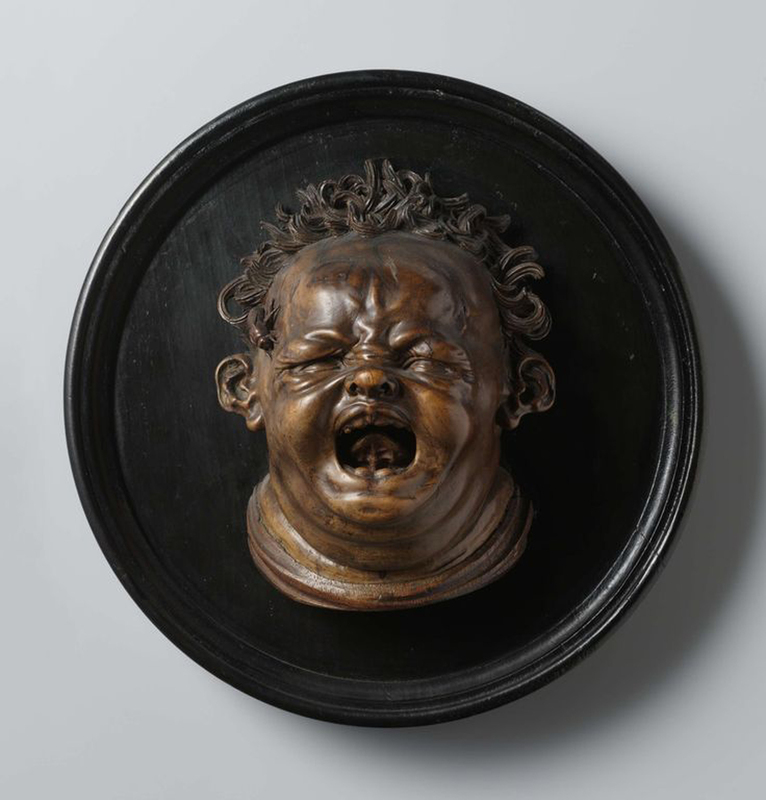 Given the focus of the Baroque on drama, theatricality, and the opposition of strong light and shade, this was a fruitful period in all senses for these depictions of strong emotion. 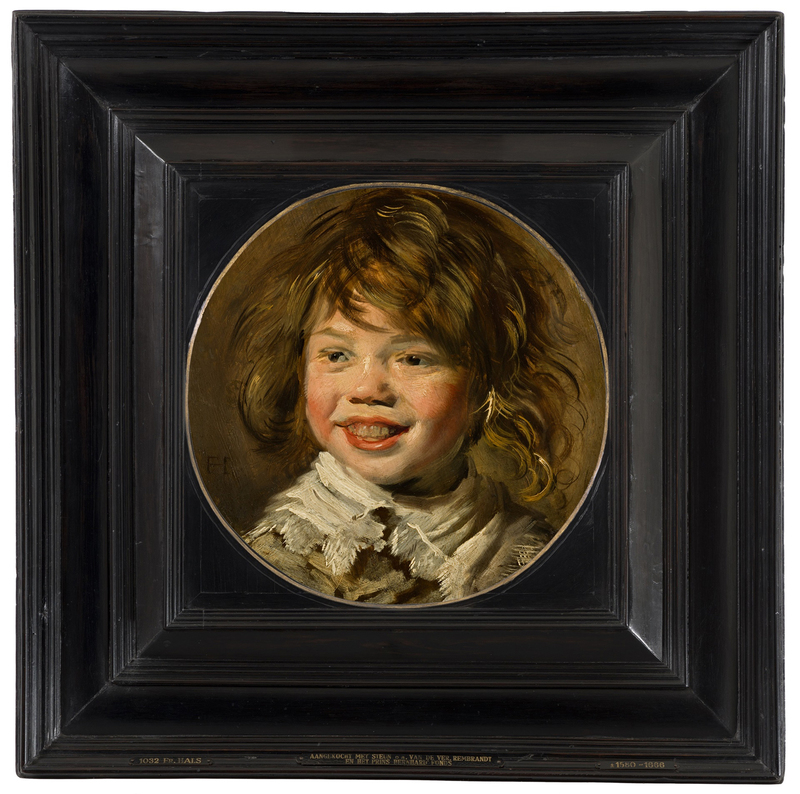 They might encompass any and every expression, from great pain in the Laocoön and De Keyser’s screaming child (it has been stung by a bee), to joy and laughter in Frans Hals’s boy (with the latter’s added difficulty of depicting teeth happily). 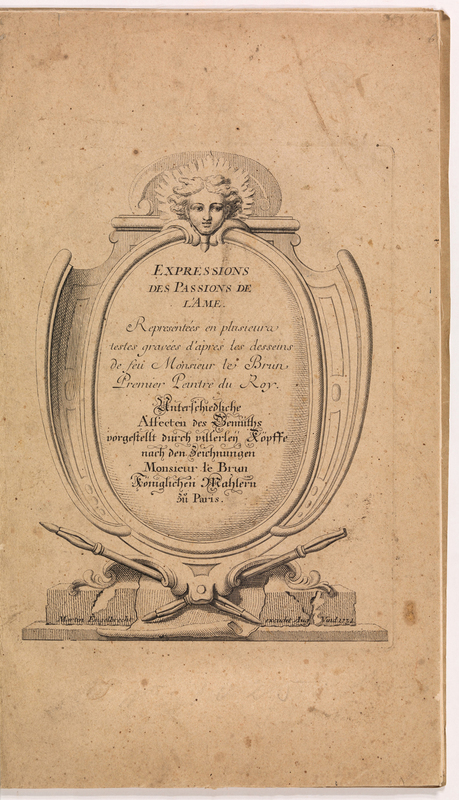 They provided the building blocks of history and subject painting, and resulted in books such as Le Brun’s Expressions des passions de l’Ame, with plates featuring ‘wonder’, ‘sadness’, and ‘laughter’, and the slightly mad-looking ‘L’attention’, above. 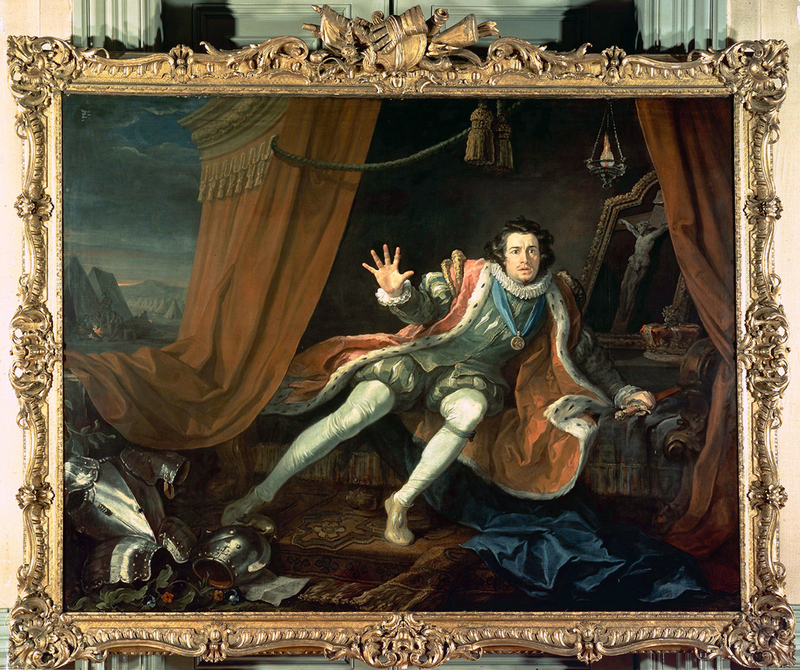 Hogarth’s portrait of the actor David Garrick expressing the height of fear and horror on stage, as Richard III encounters the ghosts of his victims the night before the battle of Bosworth Field, is another product of this interest in portraying intense emotion – here at a remove, as it is the depiction of a representation of emotion. The painting is enhanced by its beautiful and original British Rococo trophy frame, the decorative and playful qualities of which provide a suitably Baroque contrast to the painted scene, with trophies of weapons and gauntlets pointing into the future, when Richard will meet his fate in battle. The scene contains its own frame – an arched frame on a Crucifixion, like the example in the Drouot auction (above); here in Louis XIII, rather than Louis XIV, style. 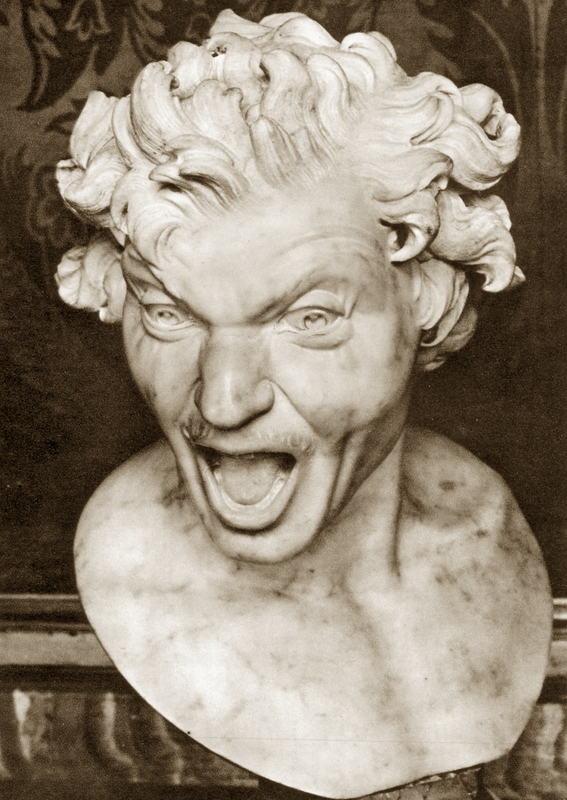 The apotheosis of the genre is perhaps Bernini’s marble sculpture of a damned soul, portrayed as a male head staring on the torments of hell which he is to undergo for eternity. It is opposed to a pendant sculpture of the blessed soul as a serene woman, her eyes uplifted to heaven. Both pieces were commissioned in about 1619 by the Spanish Cardinal, Pedro de Foix Montoya, and were placed in S. Giacomo degli Spagnuoli, the church for Spaniards living in Rome. Late in the 19th century they were moved to the Palazzo di Spagna. 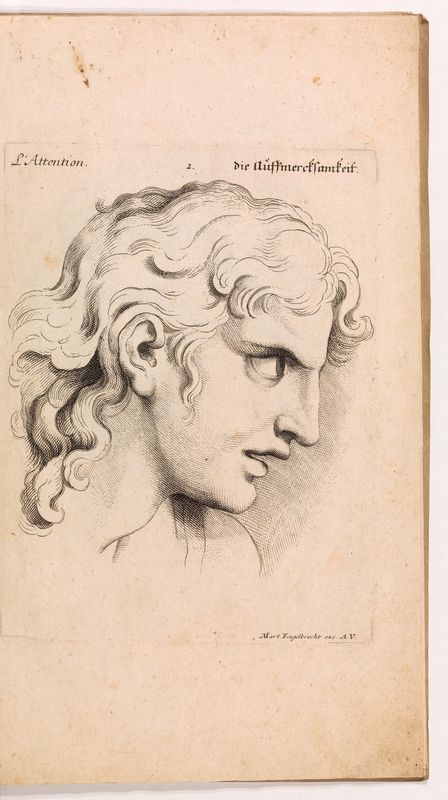 Bernini’s damned soul appears so palpably to be the inspiration for the composition and pose of the figure in Paško Vučetić’s Hatred and madness, that the latter must have seen either the bust itself in Rome when he was working there, or a print of it. The subject of the painting has its own catalyst, ‘Il canto dell’odio’ or ‘The song of hate’, a work of 1877 by Olindo Guerrini, an Italian poet known as Lorenzo Strecchetti (1845-1916). It is a poem put into the mouth of a man rejected by the woman he was worshipped, but who was promiscuous with all others. She has died, and he imagines her decayed and corrupt beauty; he also imagines himself digging up her remains, tearing out her heart and whispering his hatred into her dead ear. Vučetić paints this man as the essence of hatred, in the form of Bernini’s damned soul; the frame, by Kovačić, with its impossibly deeply canted hollow, focuses on him as if at the bottom of a well of earth or of the grave itself, with the bones and organs of the dead woman strewn around him. We are shown her faithless heart, part of her ribcage and pelvic bones, a hand, and various other stray bones with carved maggots exploring them, and at the top the nail which the ‘I’ figure will use to pin the poem to her corpse in an everlasting pillory of shame. The frame is apparently (although not very visibly) signed by Kovačić. Kovačić was three years younger than Vučetić, and trained in architecture in the Akademie in Vienna; they probably met when they returned to Yugoslavia in the last two years of the century. Kovačić built the stock exchange in Zagreb in 1924 (now the National Bank of Croatia), and the church of St Blaise, also in Zagreb. The pared-down classicism of both buildings seems widely at variance with the Gothic horror of the frame, onto which the painted nightmares of Fuseli, John Martin and Munch have strayed. Like the frames of Gothic and Renaissance altarpieces, Baroque sacred and secular scenes, important portraits, and works of all kinds from the 19th century, this frame expands upon the unembroidered (although expressive) painting, showing far more of the setting of the poem ‘L’odio’, and more of the motifs mentioned within it. Without the frame, Vučetić’s figure would be another experiment in expression, like those in Le Brun’s book; with it, we are given a whole narrative of horror.